I wish I could remember how I found out about this book. If I could find the person or website I would give them a big hug. Well, I don't think it is possible to hug a website, but if I could find a way I would. In any case, somehow I found out about the book. I love reading about early 1900s Russia. Something about the time period draws me in and doesn't let me go. Maybe it's like reading about the Titanic, always perched on the edge of your seat knowing what's going to happen, but hoping for a happy ending anyway. In any case this brings me to The Jewel of St. Petersburg. The main character in this story is Valentina Ivanova, daughter of the financial director to the Tsar. She's grown up in privilege, but tragedy strikes the family and alters the path Valentina sets for herself. Jump ahead to 1910 and we get to see Russia on the brink of change. The interesting part about this book is it has the perfect balance between the historical and the fiction. Entwined with the history, Valentina's story of what she does for love of her family and of Jens is remarkable. It twists and turns all the while taking Valentina from a children to an adult. She is such a strong character that is supported by some pretty dynamic characters as well. But what pushed me into 5 star land was really the fact that it wasn't all Valentina's story, but also Russia's story. We received the story of the revolution through Arkin, a rebel Bolshevick ready to stir the flames of change in the heart of the people. Arkin was a great foil to Valentina. I couldn't hate him from what I know of history and even what he revealed of himself through the pages. The other minus was the ending, well not really the ending per say but my own ending experience. Let's step back. Picture it. I am sitting on a crowded airplane, soaking in the climactic scenes the novel was building towards. The end happens. "Wow! What and ending! I am completely satisfied!" I say. "Oh look! An excerpt from the next book!" I skim the pages and all of the happiness I had just felt was invalidated. I was kind of angry, but I did a little research and found that this book was in fact a prequel to the excerpt I skimmed, which would make for a whole different experience for the readers who read in publishing order. I felt better after that. 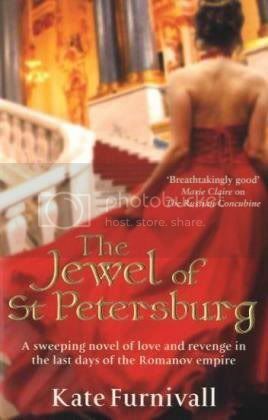 The Jewel of St. Petersburg is a wonder of historical fiction. I would recommend this to anyone. It has intrigue, war, romance, rebellion and great plot and characters. Plus look at how pretty that cover is! 5 stars! How exciting-a prequel to The Russian Concubine! This was my favorite book read last year, and I will definitely be checking out this new book. Thanks for your review! Oh this totally sounds like my type of book. Beautiful cover, AND IMPERIAL RUSSIA TURNED INTO REVOLUTIONARY RUSSIA. Yes, plz. Thank you for reviewing this, it's now on my have to get list, since it sounds freakin awesome. This book looks so good! I picked up the author's other book a while ago, but haven't gotten a chance to read it! Great review! I haven't read much historical fiction set in Russia, and I've been wanting to read Kate Furnivall for a while. Your review makes me want to order the book and read it now! I love a historical novel that centers not only on the characters, but also on the historical setting. I've been wanting to read this forever, thanks for reminding me! I read the next three in the series, and loved them, so I want to read this too.